Will THE AMAZING SPIDER-MAN make a billion dollars this summer like THE AVENGERS has? Probably not. However, with the success from THE AVENGERS, SPIDER-MAN might get some residuals of people who still need their superhero fix in a couple months in the dead heat of summer. Yesterday during the premiere of 'America's Got Talent', a new four minute extended preview was shown. A bulk of the preview is scenes we have already seen from the trailer. But the first part is an extended portion shows a pretty awesome dangling sequence. I'm not sure what more they can do to promote this film. There's so much hesitation because it's being "re-made" so soon. So, are you excited yet...because I actually am. See you there at midnight. 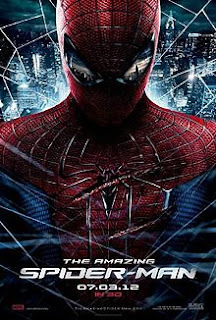 THE AMAZING SPIDER-MAN will be released July 3, 2012 starring Andrew Garfield, Emma Stone, Rhys Ifans, and Denis Leary.